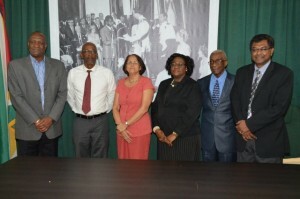 From left: Minister of State, Mr. Joseph Harmon, former Director of Prisons and Commissioner, Mr. Dale Erskine, Human Rights activist and Commissioner, Ms. Merle Mendonca, Chief Magistrate, Ms. Ann McLennan, former Judge and Chairman of the Commission, Mr. James Patterson and Minister of Public Security, Mr. Khemraj Ramjattan after today’s simple swearing in ceremony. The time-frame for the Commission of Inquiry into the recent prison riot that claimed the lives of 17 inmates and left several others injured would now be given one month to complete its work instead of the initial two weeks that had been envisaged, Minister of State Joseph Harmon said Monday. The three Commissioners, who will serve on the Commission of Inquiry (COI), ordered by President David Granger, were Monday afternoon sworn in by Chief Magistrate, Ms. Ann McLennan in the presence of Minister of Public Security, Mr. Khemraj Ramjattan and Minister of State, Mr. Joseph Harmon at a simple ceremony at the Ministry of the Presidency. The Commissioners are former Judge, Mr. James Patterson, who will serve as Chairman of the Commission, former Director of Prisons, Mr. Dale Erskine and human rights activist, Ms. Merle Mendonca. The deadline for the submission of their report has been set for March 15, 2016, to allow a full and complete investigation to be completed. Delivering a brief comment to members of the media, following the ceremony and a briewith the Commissioners, Minister Harmon acknowledged that the initial time frame may not have been adequate. “We have pushed that back because we have recognised that that timeline is not enough for them to actually do a proper investigation so we have pushed that back for at least two more weeks. We expect that they should finish their work in about a month. They expect to take evidence from inmates from Georgetown and even from the other prisons. They will take from the relatives, prison officers and any other person who in their view can give evidence,” Minister Harmon said. Minister Harmon, in delivering his charge to the Commissioners, said that the incident at the Georgetown Prison is one which has affected every Guyanese and as such, answers are urgently needed. In this regard, he noted that it is imperative that the work of the Commission be in accordance with the Oath of Office, which they have taken. “The president has instructed that a commission of inquiry be established to enquire into the circumstances which led to those disturbances and for us to make recommendations to prevent something like that [from] happening again. This Commission of Inquiry, we believe, should be done in a very speedy fashion. While we are not trying to put any pressure on the Commissioners, it is understood that the society is looking for answers…,” Minister Harmon said. Minister Harmon said that the Guyanese people must be assured and can be assured that the Commission will not be “hoodwinked” but will ensure that its mandate is properly fulfilled. “The Commission has been given wide scope and the instrument they received, gives them as much power as High court Judge to summon witnesses and take evidence as you would in the High court and I want to give the assurance to the relatives of the deceased that they can come forward and give evidence to the Commission and the Commission has full authority to take their evidence into their recommendations to the administration,” he said. The Minister noted that while some sections of society have been calling for the COI to be held after the Police investigations are completed, the two investigations are completely different and will not interfere with each other. After a brief meeting with the Commissioners, Minister Harmon said that the Commission will meet Tuesday, March 8, 2016, to finalise the procedures and Terms of Reference (TORs). Following that meeting, the decision will then be made by the Commission as to when evidence will be gathered. “…After [the meeting], they will, in their own determination, decide at what point in time they will take witnesses… they have been given guidance so from tomorrow, the work will start. They will be at Department of Public Service. They will have to sit and work on their procedures, decide who are going to come, what they are going to do,” Minister Harmon said. The Minister of State also announced that the Commission’s deadline of March 15, 2016 has been moved so as to ensure that a full and proper investigation is conducted and the findings are well documented. On Thursday, as news broke that the men had died, the President immediately convened a National Security Committee meeting where he instructed that the Commission be established to investigate the tragedy, which claimed the lives of 17 prisoners. “We have to determine the causation, why it occurred and why it was so violent because this has never occurred before and secondly, whether the Standard Operating Procedures (SOPs) were adhered to with the conduct of the officials… The families can be assured that the Government is aware of their plight and is doing the best to ease their discomfort,” President Granger said in last week’s recording of the television programme, The Public Interest.